Interesting Facts: My Full Throttle Ride was from Florida to Virginia to catch up with classmates from our 40th High School Reunion. it was a great trip in more ways than one. l began riding in the early 70’s on my Honda 500. At 20 my bike took me from Virginia to Florida a couple of times and on to Texas. Riding was a little more rugged in those days. My favorite riding partner (my wife of 35 years) and I have made three memorable rides from Florida to Sturgis, SD including Colorado, Utah, Wyoming, Montana, Mississippi River Road and Tail of the Dragon. 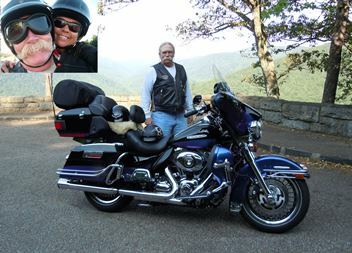 Our June 2011 trip across the Blue Ridge Parkway from North to South was beautiful and one we will never forget. The weather in Florida lends itself to ideal riding conditions nearly year-round, for which we take full advantage.